By Kori ~ March 27th, 2013. 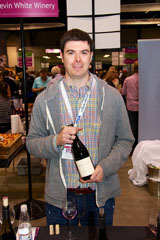 Taste Washington, held in Seattle annually, is the nationâ€™s largest single-region wine and food event. This past weekend brought Washington wine lovers from around the country to Seattle to drink, eat, and be merry. For the second year in a row, the event spanned two days with Seminars offered each morning followed by the Grand Tasting each afternoon. Hosted by Seattleâ€™s Convention and Visitors Bureau in partnership with the Washington State Wine Commission, Taste Washington is the highlight of Washington Wine Month. 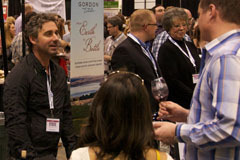 The Grand Tasting is the â€œmain eventâ€ each day. 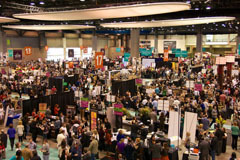 This year, Taste Washington featured over 225 wineries pouring their wines and over 65 Northwest restaurants serving small bites. With more than 750 wineries now open in the state of Washington, this event offers attendees the opportunity to try a large number of them in one place at one time. Considering the time and gas money you save not having to crisscross the state visiting tasting rooms and making appointments, the price of admission to Taste Washington is money well spent. Now, donâ€™t get me wrong, once you attend an event like this and discover some favorite new wines and wineries, you will definitely want to make plans to travel to the wineries to visit and taste again. There is nothing like spending a long weekend in Washington wine country. One of the best aspects of Taste Washington is that often you will find either the winemaker and/or winery owner pouring that wineryâ€™s wines. In addition to visiting with a number of people whose wines we have enjoyed in the past, we always find it a great opportunity to try some wines from wineries whose wines we have not previously tasted. My favorite wines from the Grand Tasting, from wineries whose wines weâ€™ve enjoyed in the past, were the 2010 Avennia Arnaut Syrah, the 2010 Betz PÃ¨re de Famille Cabernet Sauvignon, the 2010 Betz La CÃ´te Rousse Syrah, the 2010 Gorman The Evil Twin Red Blend, and the 2010 Robert Ramsay Mourvedre. For the most exciting discovery, my nod goes to Kevin White Winery. Kevin White and his wife Stefanie founded the winery in 2010 and released their inaugural wine last year. It was a pleasure to meet Kevin and taste several of his wines. They are all very good, but I was especially impressed with the 2011 La FraternitÃ© Red Wine, which is a blend of 42% Grenache, 42% Mourvedre, and 16% Syrah. And at just $20, it delivers serious bang for your buck as well. Kevin White is definitely a winery to watch. Did you attend Taste Washington this year? What were some of your favorite wines? If you live in Washington and havenâ€™t yet taken advantage of the special promotions going on this month, you have four days left to do so. But hereâ€™s to enjoying excellent Washington wine all year long. It was surely a remarkable event from an exhibitors point of view. So many “GREAT” Washington State wines in a single venue. WOW! Thanks for sharing an exhibitor’s point of view. As always, it was great from a consumer and media perspective. Glad to know those “on the other side of the table” felt the same. Cheers! Hello met and adorable vendor. We liked what her business was about. She was recycling and reusing the wine corks from the event. Seemed to be new acquiring a lot of new wineries as customers. Selling key chains and jewelry. Are there any pictures of what she sold and more contact information? We only bought one and would love more. the event was near perfect. I did not bother with any of the big name wineries this year. I went specifically to the wineries that I either had not heard of or had not tried before. There were a lot of great discoveries this year, including Estrin Estates, Lullaby, Cloudlift, Double Canyon, Gordon Estate (long time winery, but I had never tried their wines), Tempus, Stottle, and Arbor Crest among others. I’ve had the Betz, Andrew Will and other such wines before, so those were not worth wasting my palate over. I expect great wines from them, so there would be no surprises or excitement for me there. I also spent a lot of time at the Vineyards table again this year tasting through Sagemoor, Upland and Kiona vineyards. A trend I noticed this year was that the wines I found the most interesting had the very little new oak on them. Oak is fine in moderation, but some wineries are definitely overdoing it. I also noticed a TON of people with the Stella Artois Beer glasses walking around, which seemed really out of place. The food was fantastic as always, especially those bacon cupcakes they had at the cupcake table. And as always, the worst part of the event was people standing in front of the tables blocking others from getting up there. It happens at every event and I’m used to it, but it still annoys me. Thanks for sharing your discoveries and observations. It’s always exciting to discover new wineries at events like this.